There goes the neighbourhood then, took a detour past the old Cultivate space last night, the boards have gone up and the gallery walls have started coming down this week. Nothing lasts forever, especially when there’s property developers wanting to tear the heart out of things in order to make themselves a soulless pound or two. It was good while it lasted, we just about got away with cultivating down Vnyer Street for a year or two, hopefully the few galleries and spaces left down the once beautiful street can ride out the storm and survive in some kind of way. 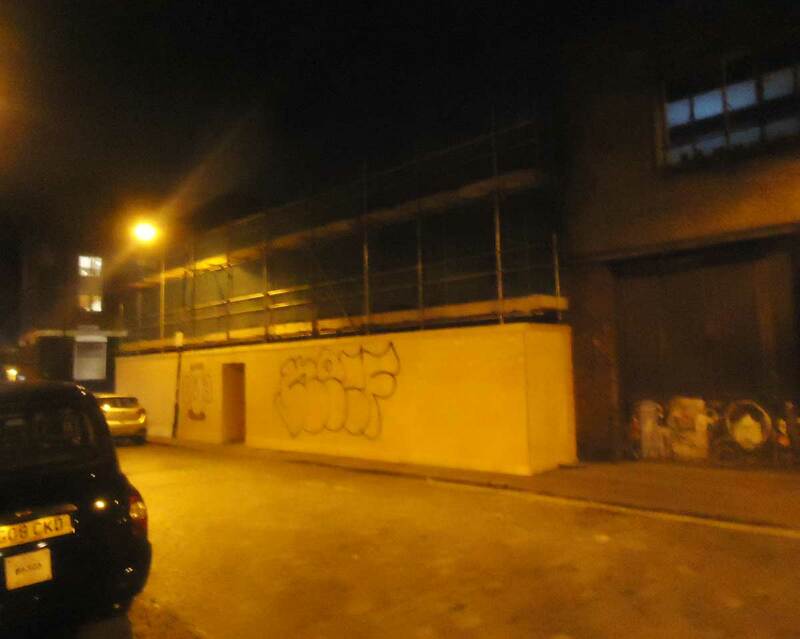 We mostly had a great time running Cultivate down on that corner in Vyner Street​. Treasure those art spaces while you still have them, fight for them, our culture, our art space, our music venues, our homes are being torn apart. Tomorrow, Saturday, we shall be over at Broadway Studios to take part in a one day show called POP up F**K off – Saturday 28th March, 3pm until late, art until 9pm, bands and DJs until later…. 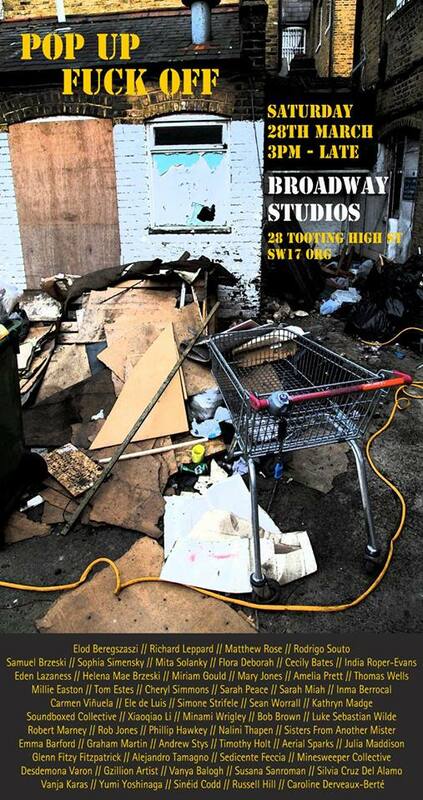 Broadway Studios, Tooting Broadway, London, SW17…. 19 rooms and a courtyard…. a beautiful old complex of buildings that in recent years has been used as art studios and, like most of the creative space of London, the studios are about to be pulled down, destroyed and replaced by more gentrification and another block of expensive flats for Russian investors who never come here to rent back to those of us who can afford to let them exploit those who do want ot live in this city of ours, . The Broadway studios show starts at 3pm, there’s artists traveling from all over the city to show work, to perform and to say goodbye to yet another creative the space. Apparently it all comes down next week, the art is up from 3pm until 9pm, then there’s bands and such. Come mark the end of another creative space…. A sad occasion but there should be a lot of art and an event to see the studios off in style..
Several parts of the ongoing ‪#‎365ArtDrops piece‬ went out last night around East London, 65 out there now, just 300 to go. Did anyone take last night’s pieces? We saw, from the top deck of the 48 bus, that one of the pieces left out last weekend was still hanging on the railings where we left it. The drops go on today in the East and tomorrow over in SW19 where that all day show takes place at Broadway Studios. I am enjoying the interaction that comes with leaving the parts of the 365 pieced piece of work out on the streets, the interaction is an important part of it. So what did happen to the pieces left out last night? Anything? We’d love to know….